At least a few decades ago, wife and mother of three Linda Brummell left the family home in Indianapolis to make it as a rock n' roller. Years later she has one forgotten album, a gig as the house band in a bar in Tanzana, and a day job at Whole Total Foods and is broke broke broke. But hey, she's having a great time on stage, she's nailing her bandmate, and she's got that weird rock n' roll hair! Then she gets a call from her ex-husband--their daughter Julie just got dumped by her husband, she was suicidal (a fact the ex-husband never mentioned to Ricki before her arrival), and his wife is out of town with her sick father and can't take care of this...So Ricki uses the last of her funds to fly out there, cheer her kid up a bit, get her hair washed (and holy cow, does Mamie Gummer have the nastiest five day bedhead you've ever seen in this movie), and reunite with the rest of the kids, one of whom is still pretty cranky at her and the other one is engaged...but wasn't going to mention it to Ricki because he doesn't want her at the wedding. But other than that, things are going pretty well until the mom that actually raised the kids comes back home and politely notifies Ricki that, well.... you can guess. Ricki goes home, back to her life, and relatively enjoys it, while still debating whether or not to go to her son's wedding --the stepmom sent her an invite as a peace offering. Her boyfriend/bandmate sells his guitar to finance the trip for them, and apparently offscreen the stepmom financed the flying in of the rest of the Flash band to play at the wedding. That's really about it for the plot of this one, there's not a lot to it, which surprised me. I was entertained watching the characters, particularly the Streep/Gummer family looking so danged alike in this one. On the other hand, I went to see this with my mother and she pretty much didn't like it due to Ricki's bizarre asymmetrical braid 'do. Which I don't like so much either, but hey, she's a rock 'n roller, what do you expect? Ricki is unapologetic for who she is in general, and it seems to me that the movie's real question is, how/if she can fit into their lives in a tangential way at this point. I read in a review that she's a Tea Partier who goes off on anti-Obama rants, which sounds gross. How obnoxious/prominent is it, in the film? Also, what's the level of Juno-esque over-cleverness in the dialogue? Diablo Cody can write decent dialogue, but when she gets too quirky-slangy-cute it drives me nuts. Jonathan Demme has made a lot of mediocre and even bad movies, but he also made Diner and a few other classics so I'm always rooting for the guy. Oh, crap, you're right. One of those things that I knew, but for a moment suddenly un-knew. The Obama stuff is not prominent. She says some homophobic stuff to a gay character (implying that being gay is a choice, although she eventually makes an effort to be more accepting), and she makes a cringe-worthy comment to an Asian-American character which every other character recognizes as cringe-worthy. I don't think it's a great movie, but my guess is that her politics/ bigotry will not be too distracting. There's no Juno-style cutesy dialogue. I think it was an interesting dramatic choice to tell it from the point of view of the movie's least sympathetic character, but I'm not sure it totally works. Rick Springfield is good, which makes me hope we'll see more of him. I wonder what he's been doing since 1984! There's only one political rant, and thankfully it isn't too long; there's also a rant about sexism, which gets pretty cringe-worthy. And yeah, there's that being-gay-is-a-choice bit in an argument with her son: he should "give being straight a try".... but the politics are dropped after that one rant, and she ends up telling her gay son she's glad he found someone to love. 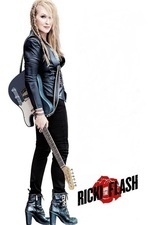 My own main complaint is just the sheer loudness of this movie: sure, Rickie and her band the Flash are rockers, but that's no reason to blast me out of my seat! It's a movie, for cryin' out loud, not an actual rock concert. And yeah, Rick Springfield is very good. I wonder what he's been doing since 1984! This AV Club interview with Springfield is surprisingly fun reading. He comes across as a guy with smarts and self-awareness, and he has a very clear understanding of the stuff he's been in that was schlocky and the stuff that was good. As a Gen-X geek I was charmed to find out how stoked he was about his brief role in the original Battlestar Galactica!